Synopsis: Darrow is a Helldiver, one of a thousand men and women who live in the vast caves beneath the surface of Mars, generations of people who spend their lives toiling to mine the precious elements that will allow the planet to be terraformed. Just knowing that, one day, people will be able to walk the surface of the planet is enough to justify their sacrifice. The Earth is dying, and Darrow and his people are the only hope humanity has left.Until the day Darrow learns that it is all a lie. That Mars has been habitable - and inhabited - for generations, by a class of people calling themselves the Golds. A class of people who look down at Darrow and his fellows as slave labour, to be exploited and worked to death without a second thought.Until the day Darrow, with the help of a mysterious group of rebels, disguises himself as a Gold and infiltrates their command school, intent on taking down his oppressors from the inside.But the command school is a battlefield - and Darrow isn't the only student with an agenda. We haven’t seen the end of dystopian fiction yet but, as Red Rising attests, the genre might be shifting its ground to new pastures: science fiction. Taking place on Mars in a universe where the solar system has been colonised for centuries, sci-fi elements remain rather subversive as Brown chooses instead to focus on the dsytopic and oppressive society that Darrow and his family inhabit deep in the red planet’s core. This might make it feel a little like a worn path retrod, but Brown narrowly avoids becoming yet another Marxist tale of the underdog rebelling against the privileged – the staple of the futuristic dystopian novel. Structurally, it isn’t dissimilar to The Hunger Games. Though it begins with the plight of the “reds”, lower-class humans whose purpose it is to prepare Mars for colonisation by the “golds”, Darrow’s life quickly moves from the oppressed to the oppressor as he dons the body of a “gold” to helm a rebellion by the hands of the Sons of Ares, a rebel force. In an attempt to reach a position of power he enters the Insitute; a school, if you can call it that, that carves ruthless leaders of “gold” teenagers by dumping them on the terraformed landscape of Mars and pitting them against each other in a bloody competition. It’s this brutal Ender’s-Game-come-Hunger-Games leadership camp that dominates the body of the novel and makes Red Rising a thrilling read as Brown relays triumph, defeat and conquest. For all intents and purposes it is both bloodier than the Hunger Games and more devastating than Lord of the Flies – a potent mix. Brown’s success lies in his science fiction infused with Roman mythology. There’s a sense of history repeating itself, of the inevitable crush of human upon human as societies are born and perish. Red Rising may be set years in the future but it could just as easily be about the rise of Rome, the tyranny of oligarchies and the bloodbaths of gladiatorial combat. Political explanations become part of the prose as Darrow learns both about himself and humanity and ideas and thoughts are explored – sometimes explicitly, though more often than not Brown tacitly feeds in philosophical works throughout. 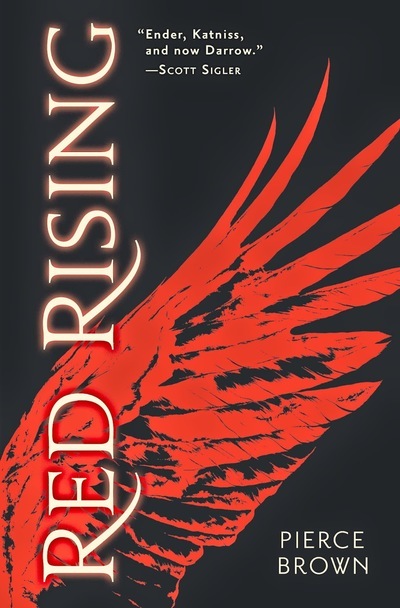 For all it’s bloodshed, Red Rising remains a thoughtful and engaging book, and that marks it out against its dystopic rivals. My only complaint is Brown’s treatment of female characters. It’s unclear why Brown doesn’t make more of them, who are all portrayed as incredibly intelligent and powerful women, yet don’t make much of a mark on the story. Coupled with the slightly contrived political dialogue (though perhaps that is intentional – politics often is conrived) and Red Rising just misses being a truly outstanding read. It’s not hard to see Brown’s influence as Red Rising is one part Hunger Games, one part Ender’s Game (consciously so!) and the remainder Lord of the Flies, though by all accounts it is bloodier, grittier and angrier than all three. Yet it doesn’t feel like a rip-off or at all derivative, and Brown successfully manages to make the ideas his own: amongst all the shared themes lies a truly addictive read, and that is as much a mark of brilliant writing as any other. The Next YA Trend: Science Fiction? 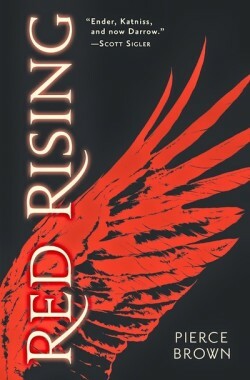 What did you think about Red Rising? My son was a big fan of the Hunger games series of books, so this sounds like it may be of interest to him too. Thank you for the review and the great giveaway too! Brown’s success lies in his science fiction infused with Roman mythology…. Red Rising sounds really cool, I keep hearing wonderful things about it. Good review 🙂 I like how your blog looks.